I wait all year for a night like tonight. Left the dock at 5:15 and headed straight to the shoal. The water was like glass and there was zero boat traffic. Then my first 4 casts resulted in spectacular blow ups and four 20 inch healthy footballs. I was in heaven. I got a call from Dabs who said he just got home and would be out in a minute. I had read a post on Tidalfish last night about using bigger plugs to catch bigger fish, so I tied on a plug that Jim from Marty's bait shop had given me. It is a long plug with two wood pieces that slide back and forth and makes the sound of blocks banging together. The plug had barely touched the water when it was inhaled by a Rock. There was no blow up..it just disappeared. After a great fight I boated a 6 pound 26 inch beauty. There is no doubt that bigger plugs catch bigger fish. As I was removing the hook, Dabs showed up. He anchored to the east of me about 20 feet from where the fish were staging. He then proceeded to catch the next 4 fish while my offering went untouched. It was only after I told him to stop "ROCK BLOCKING" me did the real action begin. We both casted to a 10 by 10 ft area off the left corner of his boat. No sooner would the plug hit the water the fish would explode. It was total mayhem with numerous double's and fish breaking all around us. 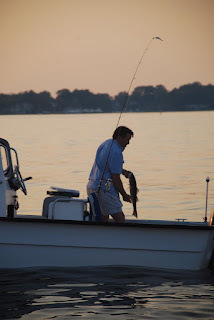 The bite continued until dark when we pulled anchor and left breaking fish behind. What a night.